For many of us, spring break has passed and the only major obstacle in the way before Glorious Summer (that absolutely deserved to be capitalized) is state standardized testing. The time of year when our students demonstrate all the goodness that we have jammed into their heads for the past six months. The time of year when our effectiveness as a teacher often rests in the minds of children. The time of year when most of us begin drinking heavily. Testing season is a necessary evil in education, so instead of fighting it, we might as well try to find a way to beat it into submission. And the biggest bat a teacher can use for that is ClassMax data. Student Tracking and Self-Reflection: Print a cumulative report of standards tracked for each student. If you are in a digital school, save them as PDF’s and share them digitally with individual students. 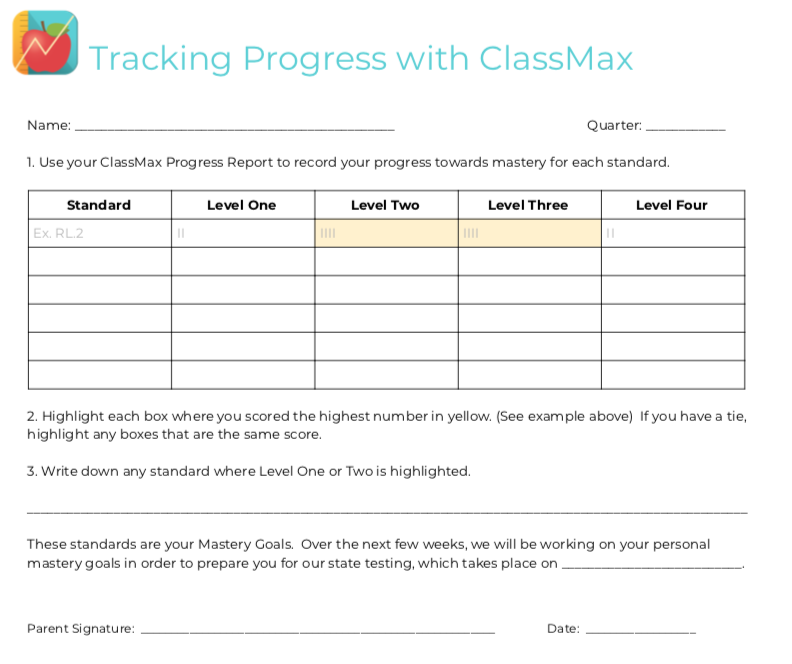 Have students complete our Progress Tracking with ClassMax document. It is recommended that these be done with your students in either a small group or an individual data chat. 2. 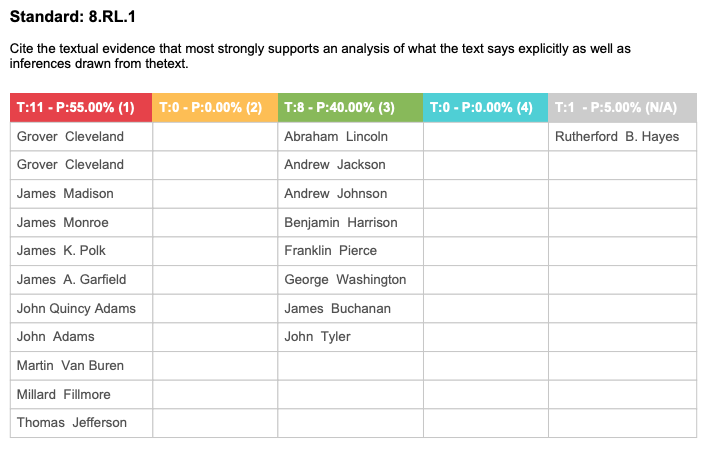 Differentiated Small Groups – Go to Reporting on the sidebar. Make sure “All Students” is selected. Select the date range for your monitoring (usually the most recent quarter is the most accurate). In the “Filter Standards” dropdown menu, select only the standards that will be accessed on your state exam. Finally, click the PDF icon and print your report. This gives you a list of where your students are averaging on this standard. You can use this to form groups for differentiated test prep activities or targeted instruction. 3. Pinpoint the most effective whole class content: From your main reports page, make sure “All Students” is selected and that your date range is appropriate. Filter the standards to show only the tested standards. This line graph will show you what areas of whole class instruction may be valuable to your students. For example, in the picture below, standard RL.1 shows 55% of students are performing in below grade level, so this might be a standard that is reviewed through whole group instruction. Run your report by class period if you want to tailor your whole group lessons by class period mastery. While testing season is stressful and hectic, your data management and personalized instruction doesn’t have to be. Let ClassMax help maximize testing success for you and your students! This entry was posted in Innovative Uses, Progress Monitoring, Reports. Bookmark the permalink.